One of the most critically acclaimed auteur-directors after India’s iconic Satyajit Ray, Adoor Gopalakrishnan creates cinema out of conviction. Not compulsion. He has made just 11 feature films in nearly four decades. One of the pioneers of the New Indian Wave, which unveiled a meaningful alternative to sensational, coincidence-ridden and plot-driven formula fare, Adoor made movies that were rooted in his native Kerala and told touching tales about real people and real issues. Born in 1941 at a time when feudalism was dying and along with it the joint family system as well as the matrilineal institution, he has been studying the community and the larger society through a microscopic examination of the individual. Adoor shows us how clinging to feudal vestiges could ruin men like Unni in Elippathayam (The Rat-Trap) and Bhaskara Patelar in Vidheyan (The Servile). Kathapurushan (The Man of the Story) documents the history of the period it is set in, and we see social and political developments through the eyes of the film’s protagonist. Mathilukal (The Walls) takes us into a jail during the British Raj, and a canvas of relationships between the prisoners and the police and among the inmates themselves is presented in its stark reality. Adoor’s characters are extraordinarily varied. A couple living in defiance of society, trying to make ends meet; a rootless, rustic simpleton unaware of his responsibilities; an ex-revolutionary wasting himself, sleeping and eating and drinking, much to the disgust of his old comrades; and a prostitute discovering love only to be separated from her lover by the guardians of society. Adoor’s cinema manages to frame details that often escape our everyday glance, turning the mundane into the magical, the commonplace into the startling. Yet, very little is known about the auteur. In Adoor Gopalakrishnan: A Life in Cinema, the first authorized biography of the Dada Saheb Phalke Award winner, Gautaman Bhaskaran traces the ebbs and flows of the life of this enigmatic director. 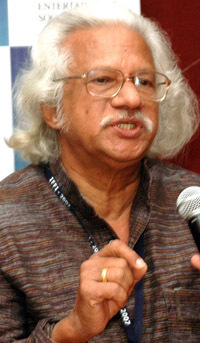 From his birth during the Quit India Movement to his lonely childhood at his uncles’ house; from life at Gandhigram, where Adoor studied economics and politics, to his days and nights at the Pune Film Institute; and from his first film, “Swayamvaram” (One’s Own Choice), to his latest, “Oru Pennum Rantaanum” (A Climate for Crime), Bhaskaran’s lucid narrative tracks the twists and turns of Gopalakrishnan’s life, finding an uncommon man and a rare auteur. Gautaman Bhaskaran is a journalist and writer, having worked in two of India’s best regarded daily newspapers, The Statesman and The Hindu, for 35 years. Now Editor South Asia for South Korea’s The Seoul Times, he also writes for a variety of other publications across the globe: Hindustan Times and The Week in India, Gulf Times and Gulf News in the Gulf, The Japan Times in Japan and Sight and Sound and Screen International in Britain. He covers major international film festivals, including Cannes, Venice, Berlin, Tokyo, Deauville, Marrakech, Dubai and several in India. He has covered Cannes alone for 20 years. He teaches cinema at Manipal University and English at Chennai’s Loyola College. He lives in Chennai with his wife, and has a son. Elippathayam (The Rat-Trap) set Gopalakrishnan free. It provided a great deliverance for him. The post-Kodiyettam years saw him disillusioned with Chitralekha, the baby he created with such care. It had produced his first two films. No more, he decided. He wanted to make cinema outside the cooperative. He himself had little money. But it came from a man of business to the core who saw the spark of brilliance in Gopalakrishnan and the value of promoting meaningful cinema. He was K. Ravindranathan Nair of General Pictures. People call him Ravi, but is better known as Cashew Ravi. He has a flourishing business in the cash crop that he inherited from his family. But often his passion for movies was stronger than his love for the kernel. Ravi had been watching the young Gopalakrishnan ever since he stepped out of Pune. Ravi followed Swayamvaram and Kodiyettam, even though he was busy producing G. Aravindan’s Kanchana Seeta (The Golden Substitute) in the late 1970s, when Gopalakrishnan’s Sankarankutty was taking Kerala by storm. worked splendidly, because Ravi gave his director a free hand; he would visit the set just once for the mahurat or the opening ceremony. And hardly ever after that. Gopalakrishnan, on his part, was not only methodical and dedicated, but also made sure that his producer got his money back, preferably with a profit. Ravi liked this commitment. He tells me at his palatial and tastefully decorated bungalow at Kollam that of all the four films, Elippathayam remains his favourite, an all time best. ‘It is closest to my heart,’ and documents in all its starkness the feudal life in Kerala, and its decline. In many ways, Elippathayam, released in 1981, is the finest work in Gopalakrishnan’s repertoire. It was his first work in colour, and it engaged me with its rich visuals, riveting narrative style and outstanding performances. I am not surprised that when it was shown at the Cannes Film Festival in 1982, Mrinal Sen, who was on the main international jury that year, remarked that he would have voted for Elippathayam had it been in the competition. It was not, and I suppose the Europeans as usual got a little muddled with Gopalakrishnan’s storytelling ways, not always simple to understand and sometimes requiring more than one viewing for fuller and deeper appreciation. International Film Guide that Elippathayam ‘is a rarity in Indian cinema in that its formal methods and visual styling become the primary tools in tracing this study of paranoia. woman, who is apparently attracted to him. The man cowers. In another scene, Unni is seen walking to a wedding, but midway he finds he cannot cross a small puddle. He returns home without attending the ceremony. In yet another instance, he refuses to budge from his bed in the middle of the night when coconut thieves are out there in his grove. fall in his own living standards. Rajamma is into her late thirties, docile and slavishly attached to Unni, who uses and exploits her, turning down one arriage proposal after another for her under some pretext or the other. She toils for him the whole day, looking after the needs of a man who does not lift a finger to help her. When a cow strays into their front courtyard, it is Rajamma who has to hurry from the kitchen at the far end of the house to chase it away. Unni’s responsibility begins and ends with a call to her. He does not even heat his own bath water. Insensitive to the core and lethargic to the point of appearing ridiculous, Unni is a classic icon of a parasitic familial system that lives on others’ labour. Loath to take on anything that he perceives as liability, he appears unaffected even by Sridevi’s elopement presumably with her college lecturer. Finally, caught between a decadent past and an inhospitable and inconvenient present, Unni crumbles when Rajamma falls seriously ill. Incapable of facing life, let alone doing even routine chores, he withdraws like a rat into a hole. Guilty and isolated, he becomes paranoid.